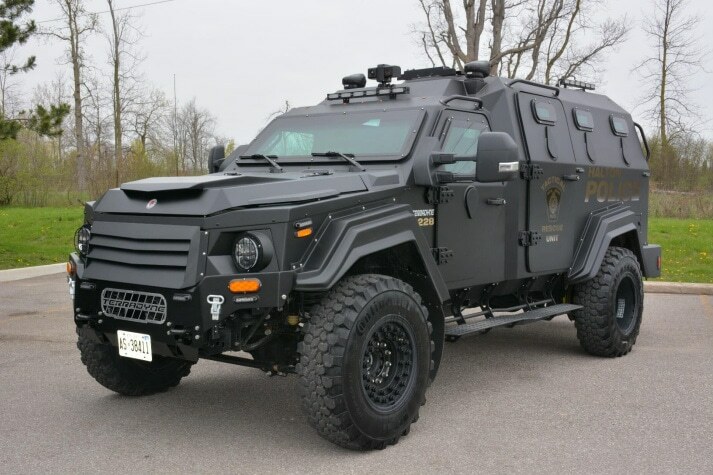 KJIPUKTUK (Halifax) – Halifax Regional Police (HRP) want a military style armoured vehicle, and there is nothing the Board of Police Commissioners can do about it. Yesterday Jim Butler, who works for HRP, did a presentation on the pros of such an acquisition to the members of the Board of Police Commissioners. The presentation was all about being prepared, and how it’s better to be safe than sorry, but no serious risk assessment or business case was included. Altogether Butler seemed ill prepared. Apparently the RCMP in HRM have their own vehicle, that is available to HRP, but Butler didn’t know how often HRP had used it, if at all. Butler also couldn’t answer when Board member and Councillor Toni Mancini asked him for examples of situations where the vehicle would have been useful in the past. Police militarization neither reduces rates of violent crime nor changes the number of officers assaulted or killed, according to a study of 9,000 law enforcement agencies in the U.S. The presentation at the Board was an FYI only, the decision is outside of the Board’s authority and has already been made. The city’s capital budget plan has allocated $500,000 for the truck, Halifax Star reporter Julia-Simone Rutger reports. Update: This morning at Halifax council budget deliberations councillor Shawn Cleary moved that the money for the armoured vehicle be removed from the budget. That motion was defeated. During the preceding discussion HRP Supt. Jim Perrin clarified that he could not guarantee that the vehicle would not be used to control demonstrations.